The Brachiosaurus is one of the largest animals our world has ever seen and was certainly one of, if not the largest sauropod dinosaur to walk the earth through the late Jurassic period. The name Brachiosaurus originates as a combination of the Greek words for ‘arm’ and ‘lizard’, this name was given to the Brachiosaurus because due to the fact that its forelimbs or ‘arms’ were much larger than its hind limbs. The Brachiosaurus is a species of sauropod that roamed what is now considered North America and was first discovered by Elmer Riggs in 1990. The Brachiosaurus is similar to the Giraffatitan which is another sauropod found in Africa, however the Brachiosaurus is considered to be the larger of the sauropods with the Giraffatitan boasting longer limbs. The sauropod family, of which the Brachiosaurus belongs to consists of very large herbivorous animals who walk and all fours and have extremely long necks some-what resembling a modern day giraffe in structure. 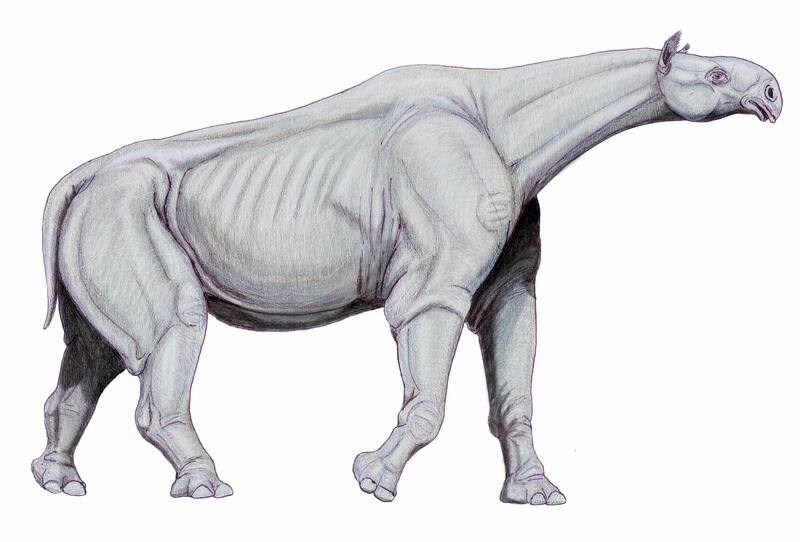 Other unique characteristics of the sauropods is that of a long tail and very small brain for its size. The Brachiosaurus and indeed other sauropods have curious holes in their skulls which were initially believed to be nostril, however more likely these existed to reduce weight. Tell tale signs of the Brachiosaurus’ plant eating diet include chisel shaped teeth which were perfect for stripping plant material and clawed front feet which would aid in grip in the event the Brachiosaurus would need to elevate itself to fee. The hind feet were also clawed and this most likely helped with grip and balance. Interestingly the Brachiosaurus was warm blooded and judging by the gigantic size of the Brachiosaurus this would mean the food intake on a day to day basis would have to be absolutely massive as the Brachiosaurus was believed to reach full adult size in only ten years. 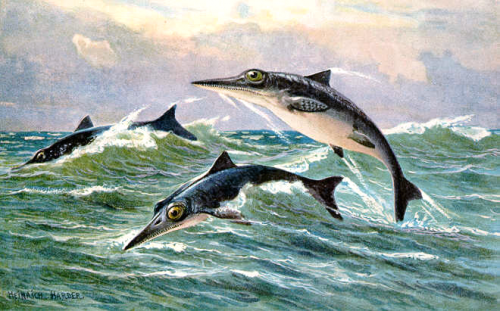 In comparison to this a cold blooded creature would for example, take maybe 100 years rather than ten to reach this size and would survive on less food per day. 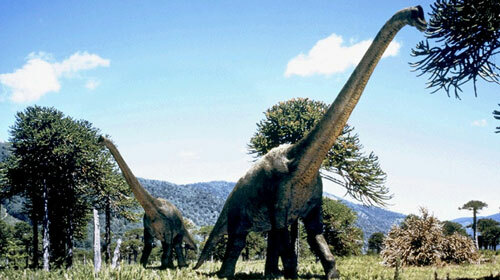 The Brachiosaurus is not a real dinosaur. 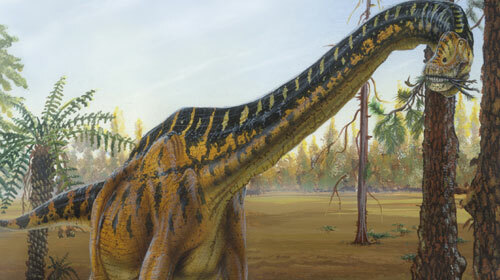 Although it bears much resemblence to a giraffe, the body of the Brachiosaurus was found in one dig site, and the head was found in a completely different dig site. An American scientist decided to put the two together and name it Brachiosaurus.